Size of this preview: 800 × 536 pixels. Other resolutions: 320 × 214 pixels | 640 × 429 pixels | 831 × 557 pixels. 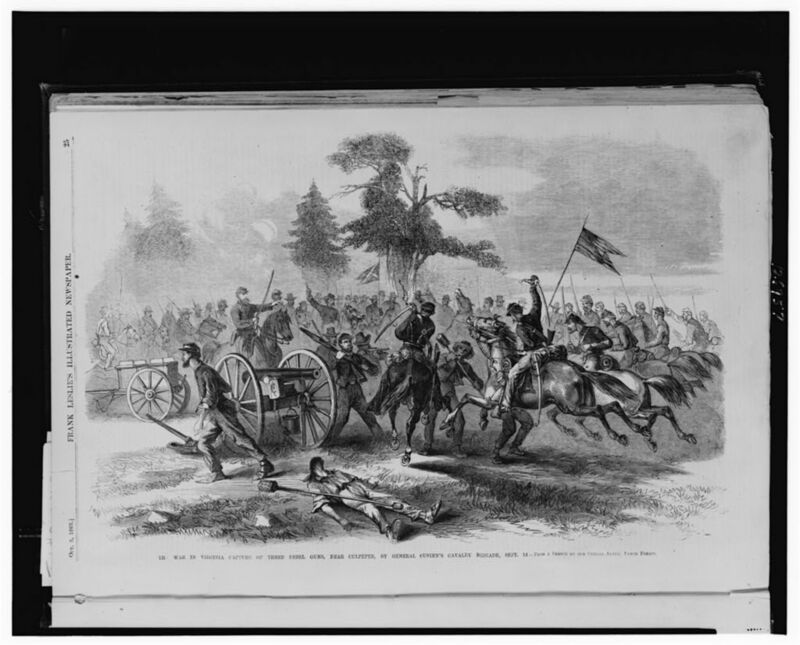 TITLE: The war in Virginia--Capture of three Rebel guns, near Culpeper, by General Custen's cavalry brigade, Sept. 14 / from a sketch by our special artist, Mr. Edwin Forbes. REPRODUCTION NUMBER: LC-USZ62-126957 (b&w film copy neg.) No known restrictions on publication. Illus. in: Frank Leslie's illustrated newspaper, v. 17, no. 418 (1863 Oct. 3), p 25. Cavalry--Union--Virginia--Culpeper--1860-1870. United States--History--Civil War, 1861-1865--Campaigns & battles. Periodical illustrations 1860-1870. Wood engravings 1860-1870.
current 05:02, 8 February 2016 831 × 557 (89 KB) Taterian (talk | contribs) Cropped 19 % horizontally and 32 % vertically using CropTool with precise mode.